At first glance, you could be forgiven for thinking you’re looking at some kind of ultra-small MacBook Air on the right, next to my MBA 11. It’s actually my iPad Air 2 in the ClamCase Pro keyboard case that combines all-round protection with a near-laptop-quality keyboard. Aesthetically, the ClamCase Pro is a slightly odd mix. The keyboard itself is clearly closely modelled on a MacBook keyboard, chiclet keyboard with black keys set into an anodised aluminum base. 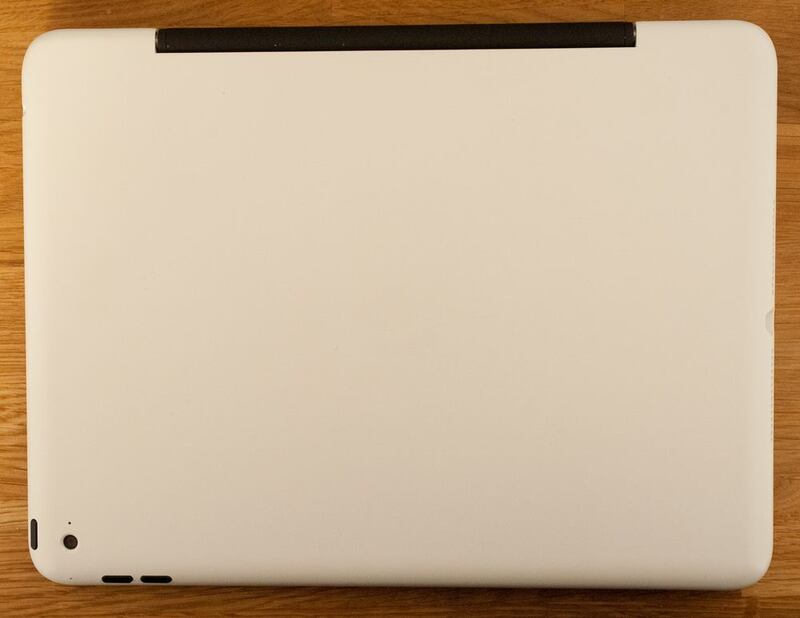 The recessed ‘tray’ in which the keys sit is made from white plastic, in place of the all-aluminum MacBook casing, but is otherwise almost a clone. 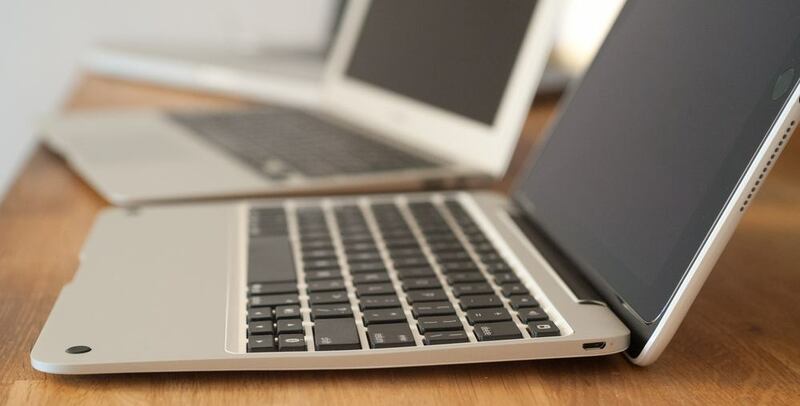 The wedge shape of the keyboard also closely mimics the look of a MacBook Air, especially with the laptop-style rear hinge. ClamCase doesn’t have too much choice about the material: the way the iPad Air 2 snaps into the top shell means that it has to be flexible, ruling out aluminum–even if the cost didn’t. And making it silver, as a kind of fake aluminum would, I think, look cheap against the real thing. 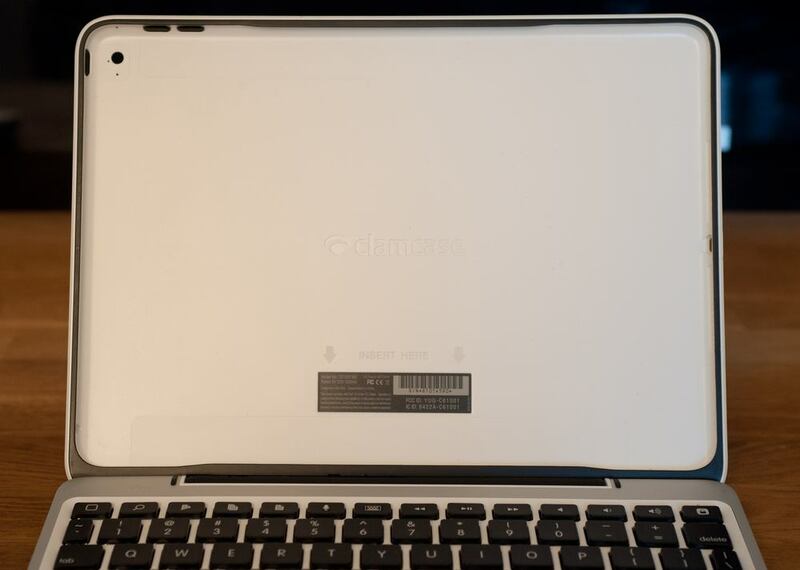 But it does give the case a slightly schizophrenic look: MacBook quality from the front and side, and a cheaper look from behind and when closed. Personally, I’d prefer black to white, but that will come as no surprise to anyone who knows me. 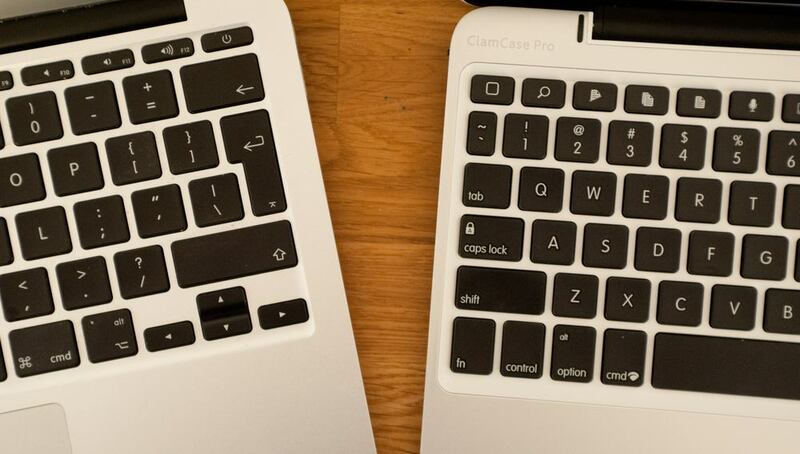 The ClamCase Pro is impressively thin, at just 0.74-inches deep. This makes it about three times the thickness of the naked iPad, which is extremely impressive for a keyboard case. The aluminum base does mean it weighs 1.2lbs, more than doubling the weight of the iPad alone, but for me this is a price worth paying for the quality. The first time you insert and remove the iPad, it does feel a little scary, bending back the stiff plastic of the top shell with what feels like a fair degree of force. But once you are confident it isn’t brittle enough to crack, you’ll find yourself snapping the iPad in and out of the case in a second or two. Bluetooth pairing is simple, and reconnecting was flawless in my experience. The case switches off automatically when closed, but was always instantly ready for use every time. I’m British, and therefore not normally prone to hyperbole, but I love, love, love using this keyboard case. Unlike some keyboard cases, where the iPad sits some way toward you, the clamshell design places the screen right at the back, exactly like a laptop. The quality of the hinge is excellent. In laptop mode, the case is held very securely at an angle I find equally comfortable on my lap and on my desk, and feels rock-solid. The keyboard quality isn’t quite up to the standard of a MacBook, but it’s close–very close. It’s easily the best keyboard case I’ve ever used when it comes to the typing experience. My one complaint is that it isn’t backlit. It’s not something I need often, but from time to time backlighting would be very handy. As usual with iPad keyboards, there are dedicated keys at the top for things like copying and pasting, as well as volume and music/video controls. The hinge mechanism has a clever three-position design which allows you to use it as a laptop, as a stand and folded right flat against the back of the iPad to give you a rather thick tablet. Personally, the ease with which you can snap the iPad in and out means that if I want to use the iPad without the keyboard, I’ll just remove it and put the case back in my bag, but some may find this useful. In stand mode, it has a soft-stop rather than a click-stop, so is slightly springy when touching the iPad. This doesn’t bother me as I only use stand mode when passively viewing video, but might be slightly annoying in active use. Usually, I’d just use a ‘Conclusions’ heading here and mention the price at the end. But in this case, the price is sufficiently … noteworthy … to get at least half a heading to itself. Sitting down? Okay. The recommended retail price for the case is $169. Yep, that’s a third the price of the cheapest iPad Air 2 model, and adds 20% to the price of even the most expensive 128GB cellular model. It’s a pretty frightening price for a keyboard case. Worse, while you can usually find better deals on Amazon for most gadgets, I wasn’t able to do so for this–other than used models. If you want this case, you’re going to have to take a deep breath and tell your credit card to brace itself. Is it worth it? For me, it depends how you use your iPad. My iPad goes almost everywhere with me, and I do a lot of typing on it. I use it for emails, even lengthy ones sometimes. I use it to write articles. I even use it to work on a novel. So for me, a high-quality keyboard is a necessity rather than a luxury. In a week of heavy usage, I’ve found the ClamCase Pro so good that I’ve stuck to my iPad even in situations where I would otherwise have switched to my MacBook Air. For me, the keyboard is that good–and justifies the price. Your mileage may vary. All I can say is that, after trying this, I don’t ever expect to use anything else. 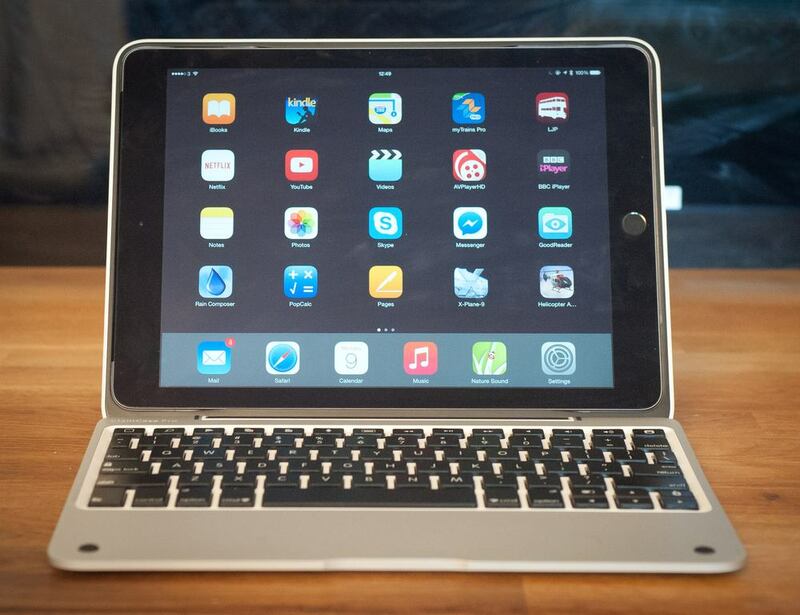 The ClamCase Pro range of keyboard cases for iPad 2/3/4, iPad Air and iPad Air 2 cost $169. For the iPad mini, they cost $129.